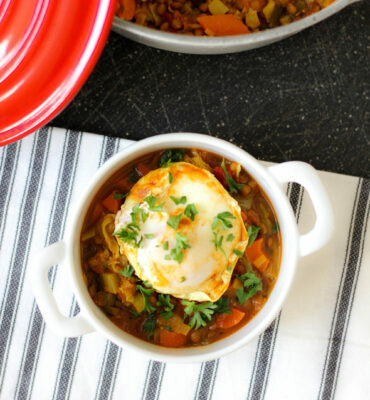 West African recipes never fail to deliver a serious flavor punch, and this Red Lentil Stew is no exception. I originally shared the recipe in our Clean Cuisine book. To be honest, I had kind of forgotten about it until I stumbled on–and made— Dadisi Olutosin’s West African-inspired collard green recipe featured on NPR. Oh. My. Gosh. Out of this world! I know the idea of getting super excited about collard greens might seem a little strange, but Olutosin’s collard greens are insanely good. The best I have ever had. And like so many West African dishes, they are healthy. I make it a point to eat beans (or lentils) once a day. I eat them because I think they are one of the healthiest foods on the planet (by the way, beans have been found to be a staple food for centenarians living in Blue Zone regions around the world.) I’m the first to admit though, they are not always the most exciting foods to eat. But add a little spice…and WOW! 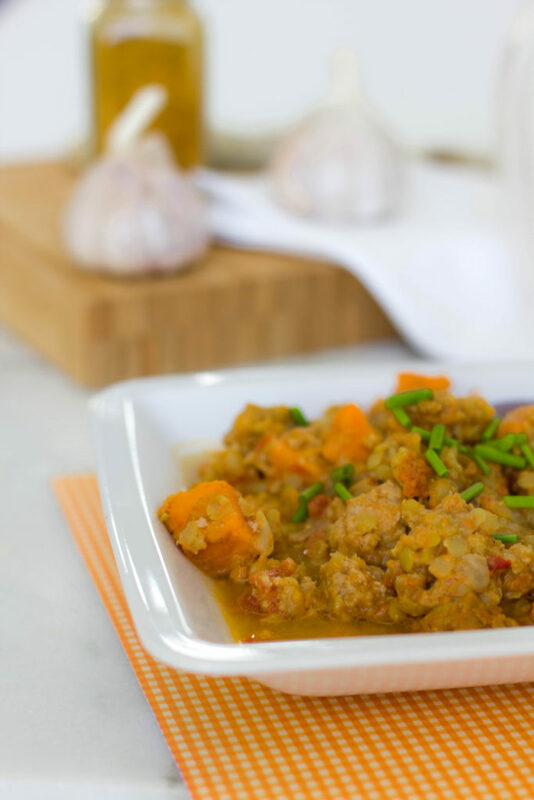 Ginger, garlic, cloves, garam masala (this is a complex spice blend and is readily available in the spice aisle of just about any supermarket), curry, coconut and—believe it or not—peanut butter, all combine to deliver an incredibly rich and complex-tasting dish. Peanuts are used a lot in African cuisine, because they are inexpensive, filling and really do wonders for adding a lot of flavor. Best of all, the whole thing takes no time at all to make. The recipe really just has two steps. The slow cooker and spices do all the work! Heat the oil in a large heavy skillet over medium heat. Add the onions and saute 4 to 5 minutes. Add the garlic and ginger and continue cooking another 2 to 3 minutes, or until onions are softened. Add the ground turkey and salt; cook until turkey is cooked-through, about 5 minutes. Transfer turkey mixture to a 5 or 6 quart slow cooker. 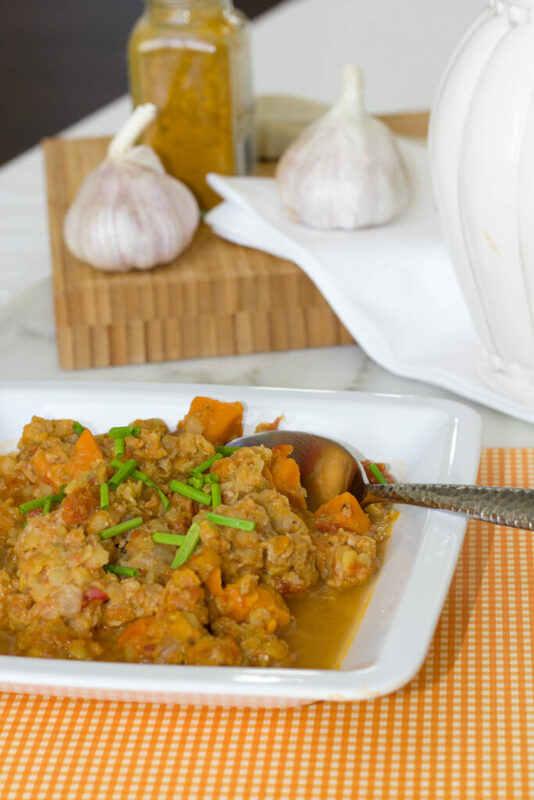 To the slow cooker, add the sweet potatoes, curry powder, garam masala, tomatoes, coconut milk, vegetable broth, peanut butter and lentils. Mix to blend ingredients well. Cover and cook on high for 3 1/2 hours, or until sweet potatoes are soft. Serve warm.